Pushing your songwriting to the limit is worth it. 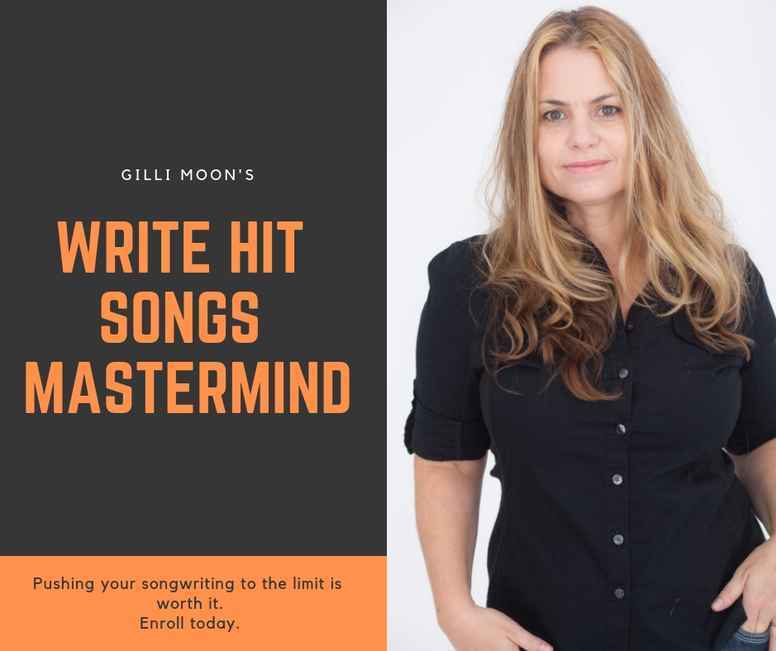 Enroll today in gilli moon's Write Hit Songs Mastermind and write 3 hit songs in 6 weeks, get one-on-one feedback and learn the ins and outs of the songwriting business. At the end of the mastermind program you will have everything you need to lead a successful songwriting career. There is a song; and there is a Hit Song. Which one do you want to write? Are you a Hit Song Maker? Have you committed a lifetime to writing and pitching or performing songs, all the while seen other songwriters, some even in your own community, made it with Hit Songs while you're still waiting....? Are you feeling the financial pinch? Are you spending money recording songs and trying to make a living with your music, but still having to do the 9-5 job? Are you spending months, perhaps years, crafting the perfect song so that it can become a Hit? It's time to write that hit song and be rewarded for it. Are you ready to write songs that will be valued by the music industry? Are you ready to get your songs on the music charts? Are you ready to earn a living or increase your wealth through songwriting? Are you ready to open up your songwriting toolkit and knowledge to write amazing songs? The Ultimate Mastermind for Songwriting Career Success. Writing hit songs is about mastering your mindset, setting goals, and a solid writing commitment. The Hit Song Mastermind shares what it takes to write hit songs and what it takes to be a hit songwriter in the new music business. My coaching and writing tells of being a different kind of songwriter in the music business. I write about the craft of songwriting, and how we need to write for radio friendly songs now, as well as how to sustain a career in the music business. Going through the hit songs blueprint that the music industry and the radio is dictating, so you understand how to hone your songwriting style to meet today's current trends. Gaining the tools and techniques to be a successful hit songwriter. I cannot tell you how many times I have met songwriters, like, hundreds of songwriters, through my workshops, and my conference talks, that write and write and write, but they just don't make GREAT songs that can be LICENSED or CUT by other artists, let alone hit any Spotify charts for themselves. I've known songwriters who have written for 20 years and still no success. And then there are other songwriters who are effective in writing songs, but have no idea how to get their songs to the right people. Even then, I've met songwriters who can craft a good song, and may even know how to create music business connections, BUT just cannot sustain financial stability to make songwriting their only career. You see, part of the problem is not having a clear Gameplan. A step by step plan to achieve clear, tangible goals, to not just songwriting success, by CAREER success. You can't have a hit song without a hit PLAN. And you can't have a hit plan, without the hit song. And My Write Hit Songs Mastermind will give you BOTH. 4. Beautiful, golden gems on writing successful songs and being a consummate professional Songwriter. VALUE: Priceless! 5. Songwriting Business and Marketing tips along the way to advance your writing career. VALUE: Priceless! PLUS, you'll receive SPECIAL Bonuses just for signing up. BONUS 1 - Free Songsalive! Pro Songwriter Membership (access to resources and learnings from the largest international non-profit songwriters organization at your disposal for a full year) VALUE $99.00. Yours Free. BONUS 2 - My book, as a paperback and e-book, THE 360 DEGRE SONGWRITER - The Whole-istic Approach to Becoming a Hitmaker. Signed and delivered to your doorstep. VALUE $30.00. Yours Free. This book that I've written is creative and, tactical. It takes my coined ‘360º’ approach to craft a great ‘Hit’ song and beyond that, craft a HIT SONGWRITING CAREER. We’ll look at what is a ‘Hit’; we’ll dive deep into my Hit Song Recipe (Twenty defined ingredients that constitute my special ‘Hit Song’ sauce); we’ll develop an understanding of how to write a ‘Hit’ song and why you should write at least one for your catalog. Who knows, once you get hooked, you may realize that all your songs can be Hits! BONUS 3 - How Songwriters Can Network - Video Course - jumpstart your networking skills in the songwriting business. Watch it at your pace, in your own time, online (video series). VALUE $160. Yours Free. My name is Gilli Moon. 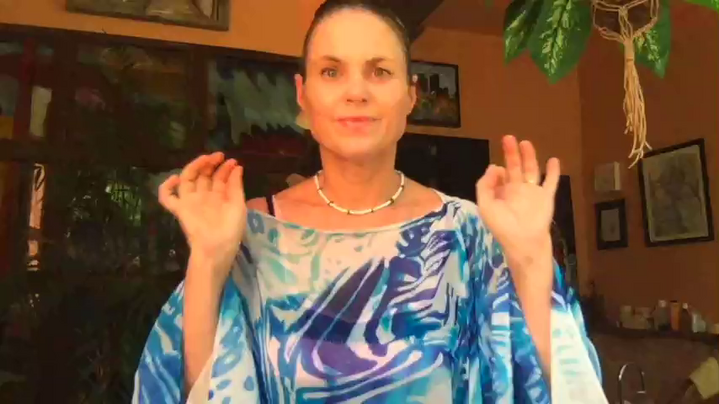 I am an artist entrepreneur and songwriting coach, and I work with artists and songwriters worldwide to BUILD their personal and professional dreams, to ACHIEVE their goals, develop skills, and EMPOWER them towards the life and career they've ALWAYS imagined. As a songwriter, I’ve written hundreds of songs with a multitude of songwriting awards and cuts by artists and in film and television programs. I have 7 albums out as a recording artist and I tour the world performing. I’m also the creator and President of Songsalive!, the largest non–profit songwriters membership organization, and coach at The Creative Warrior Academy, with 3 published books, one being "The 360 Degree Songwriter - The Whole-istic Approach To Becoming a Hit Maker", and dozens of programs and workshops. I do all of this while living my OWN dream of performing and creating. Success in the music industry as a songwriter all starts with the song. My goal is to help you deliver the best song to the industry and ALSO to have a well-rounded understanding of the songwriting business and what it takes to make that song a HIT: what I call a 360 Degree, whole-istic approach. I want you to have the best career as a songwriter, as you possibly can. This is why I created the WRITE HIT SONGS MASTERMIND PROGRAM. I offer not only personal coaching sessions to provide feedback on your songs, but to learn my hit song strategy, but also you will write up to 3 COMPLETED songs by the end of this mastermind. You'll also be included in not 1 but 2 songwriting communities (my private Facebook group and Songsalive! songwriters organization), as well as instantly receive and own forever, my book and my Video Course, to go through at your leisure. Pushing your songwriting to the limit is worth it. HOW MUCH IS THIS 6 WEEK MASTERMIND PROGRAM VALUED?....with the 3 sessions, exclusive hit song strategy, feedback, 3 written golden songs, access to the private communities and amazing content? SPRING SPECIAL till May 1 $827. Save $150. Hurry! That's only $827 for the entire 6 weeks, 3 one-on-one private sessions with Gilli, all written and video content that you can keep FOREVER + all the bonuses and 3 full written hit songs to show for it. I cannot wait to sink my teeth (mind, ears and heart) into your songwriting career. Let's Start, shall we? ARE YOU READY TO BE A HIT SONG MAKER WITH A GREAT GAME PLAN + 3 GOLDEN SONG GEMS READY TO TAKE ON THE WORLD? YES! I am ready to have a SONGWRITING CAREER that brings me success. YES! I'm ready to master my mindset, set goals, and have a solid writing commitment. YES! I'm ready to engage in a Mastermind Program for SIX (6) weeks, and I can't wait to work with Gilli! YES! I am willing to set aside 30+ minutes every two weeks to meet with Gilli (online Skype/Facetime sessions) over a 6 week period (3 sessions total), as well as dedicate at least another 2-4 hours a week to write songs in preparation of the sessions, plus set aside reading and watching time to read the companion book and watch Gilli's awesome videos. YES! I understand that the terms of payment (read below), and am willing to invest in this Mastermind Program till the end. YES! I know that once I make payment, if I decide to cancel, or if I can't for whatever reason, commit to 4 one-on-one sessions within the month*, I do not get a refund, because I have instant access to the content provided, and Gilli spends a lot of time and energy to include, nurture and train me, plus there are only a few spaces for the Mastermind group. (* Gilli: I do my best to offer makeup sessions for scheduling issues, as long as I have 48 hour notice, and it's within this 6 week mastermind period). Timezone Please select... (GMT-12:00) International Date Line West (GMT-11:00) American Samoa (GMT-11:00) Midway Island (GMT-10:00) Hawaii (GMT-09:00) Alaska (GMT-08:00) Pacific Time (US & Canada) (GMT-08:00) Tijuana (GMT-07:00) Arizona (GMT-07:00) Chihuahua (GMT-07:00) Mazatlan (GMT-07:00) Mountain Time (US & Canada) (GMT-06:00) Central America (GMT-06:00) Central Time (US & Canada) (GMT-06:00) Guadalajara (GMT-06:00) Mexico City (GMT-06:00) Monterrey (GMT-06:00) Saskatchewan (GMT-05:00) Bogota (GMT-05:00) Eastern Time (US & Canada) (GMT-05:00) Indiana (East) (GMT-05:00) Lima (GMT-05:00) Quito (GMT-04:00) Atlantic Time (Canada) (GMT-04:00) Caracas (GMT-04:00) Georgetown (GMT-04:00) La Paz (GMT-04:00) Puerto Rico (GMT-04:00) Santiago (GMT-03:30) Newfoundland (GMT-03:00) Brasilia (GMT-03:00) Buenos Aires (GMT-03:00) Greenland (GMT-03:00) Montevideo (GMT-02:00) Mid-Atlantic (GMT-01:00) Azores (GMT-01:00) Cape Verde Is. (GMT+00:00) Edinburgh (GMT+00:00) Lisbon (GMT+00:00) London (GMT+00:00) Monrovia (GMT+00:00) UTC (GMT+01:00) Amsterdam (GMT+01:00) Belgrade (GMT+01:00) Berlin (GMT+01:00) Bern (GMT+01:00) Bratislava (GMT+01:00) Brussels (GMT+01:00) Budapest (GMT+01:00) Casablanca (GMT+01:00) Copenhagen (GMT+01:00) Dublin (GMT+01:00) Ljubljana (GMT+01:00) Madrid (GMT+01:00) Paris (GMT+01:00) Prague (GMT+01:00) Rome (GMT+01:00) Sarajevo (GMT+01:00) Skopje (GMT+01:00) Stockholm (GMT+01:00) Vienna (GMT+01:00) Warsaw (GMT+01:00) West Central Africa (GMT+01:00) Zagreb (GMT+01:00) Zurich (GMT+02:00) Athens (GMT+02:00) Bucharest (GMT+02:00) Cairo (GMT+02:00) Harare (GMT+02:00) Helsinki (GMT+02:00) Jerusalem (GMT+02:00) Kaliningrad (GMT+02:00) Kyiv (GMT+02:00) Pretoria (GMT+02:00) Riga (GMT+02:00) Sofia (GMT+02:00) Tallinn (GMT+02:00) Vilnius (GMT+03:00) Baghdad (GMT+03:00) Istanbul (GMT+03:00) Kuwait (GMT+03:00) Minsk (GMT+03:00) Moscow (GMT+03:00) Nairobi (GMT+03:00) Riyadh (GMT+03:00) St. Petersburg (GMT+03:30) Tehran (GMT+04:00) Abu Dhabi (GMT+04:00) Baku (GMT+04:00) Muscat (GMT+04:00) Samara (GMT+04:00) Tbilisi (GMT+04:00) Volgograd (GMT+04:00) Yerevan (GMT+04:30) Kabul (GMT+05:00) Ekaterinburg (GMT+05:00) Islamabad (GMT+05:00) Karachi (GMT+05:00) Tashkent (GMT+05:30) Chennai (GMT+05:30) Kolkata (GMT+05:30) Mumbai (GMT+05:30) New Delhi (GMT+05:30) Sri Jayawardenepura (GMT+05:45) Kathmandu (GMT+06:00) Almaty (GMT+06:00) Astana (GMT+06:00) Dhaka (GMT+06:00) Urumqi (GMT+06:30) Rangoon (GMT+07:00) Bangkok (GMT+07:00) Hanoi (GMT+07:00) Jakarta (GMT+07:00) Krasnoyarsk (GMT+07:00) Novosibirsk (GMT+08:00) Beijing (GMT+08:00) Chongqing (GMT+08:00) Hong Kong (GMT+08:00) Irkutsk (GMT+08:00) Kuala Lumpur (GMT+08:00) Perth (GMT+08:00) Singapore (GMT+08:00) Taipei (GMT+08:00) Ulaanbaatar (GMT+09:00) Osaka (GMT+09:00) Sapporo (GMT+09:00) Seoul (GMT+09:00) Tokyo (GMT+09:00) Yakutsk (GMT+09:30) Adelaide (GMT+09:30) Darwin (GMT+10:00) Brisbane (GMT+10:00) Canberra (GMT+10:00) Guam (GMT+10:00) Hobart (GMT+10:00) Melbourne (GMT+10:00) Port Moresby (GMT+10:00) Sydney (GMT+10:00) Vladivostok (GMT+11:00) Magadan (GMT+11:00) New Caledonia (GMT+11:00) Solomon Is. (GMT+11:00) Srednekolymsk (GMT+12:00) Auckland (GMT+12:00) Fiji (GMT+12:00) Kamchatka (GMT+12:00) Marshall Is. (GMT+12:00) Wellington (GMT+12:45) Chatham Is. (GMT+13:00) Nuku'alofa (GMT+13:00) Samoa (GMT+13:00) Tokelau Is. Gilli is the consummate artist’s coach. An artist herself, she understands the creative life and what it takes. But more than just an artist, Gilli is skilled at coaching other artists to help realize their vision. Gilli's resources have helped me to develop my business foundation and create a business and marketing plan to grow it. She has a unique ability to listen and be able to hone in on where she can direct me to resources she has available.... Gilli is a master at Time Management.... She is a no-nonsense, hard working coach, who lives by her word and has proven her techniques successful. She is inspirational not only with how she has created and modeled her entrepreneurial business but also how she generously shares her information with others. I’ve been a coaching client of Gilli’s and she has a unique ability to listen and be able to hone in on where she can direct me to resources she has available. She is a wealth of information and literally has everything at her fingertips (a few key strokes away). EGilli has been a great support. I consider myself an entrepreneur working for myself and by myself, I think of her as my supervisor that I can go to for questions and feedback, which makes the task less overwhelming. I was completely overwhelmed with running my own business, and pretty unorganized when I first started working with Gilli.... She helped me to organize my thoughts, goals and direction, and to find out what my truth was... "what was success to me?" ... She inspires me to be my best, and to give myself the best chance to follow my dreams. I was my biggest road block. Gilli genuinely cares about me and about helping me follow my dreams; I'm sure she's the same way with all of her clients. Her energy, honesty, passion and heart are an inspiration to me. I'm truly grateful for her support and guidance in my life. Everything you talk about is insightful and it always encourages me to keep moving forward, both as a business woman and an artist, and also in my life as a whole--everything wrapped up in a ball that makes me who I am. I'm so glad our lives crossed paths! After our sessions, I hang up the phone thinking, "wow, she totally gets me and what I'm going through!"